During the first few years of grade school the milk we got at lunch came in a little pyramid shaped carton. There was something really cool about them to a little kid. Especially because if you closed the drinking spout just right and stomped down at just the right angle you could make a really loud pop out in the parking lot during recess. It was a cherished skill to master. Awesome. Fun will now commence. As I recall, dixie cups on wood floors pop really good too. I learned this when our grade school was invited to the neighboring Catholic school for some sort of event, no doubt proving to many there what kind of wicked hooliganism was the result of a public school education. Huh. So I’m assuming this is how he repairs the broken bones he seems to be getting on an almost daily basis. I used to jump on chocolate milk and iced tea cartons in junior high to annoy my friend. Somehow I’ve stopped doing that now that I’m in senior high. Maybe I’m growing up. Uh-oh. @Ziriath: considering he has spare heads, that’s a strong possibility. Then again, his thermos might be very leg-like in appearance. Also, my elementary used these square-ish plastic pouches for their milk. Some would use a straw, but many would just bite out a corner. Man I wish it were that easy….better with Osteoporosis. So that’s how you spell it! It sounds so much like osteo*per*osis, but *por*osis makes so much more sense. I also learned today that -osis means “process of” and not “disease of.” As in “the process of bones becoming porous.” Makes “osteoporosis” sound like so much less of a mouthfull by comparrison, hey? Ummm… sorry about all that. Words are, like, my thing. @Billymoejoe: Spare heads? Wow! I don’t suppose you know the number to that one off hand? Anyone? Heh, good comic today, though now you might need a comic for spare legs. We still have those triangular milk-thingies around the place in Australia, at a few supermarkets here and there. You can get fruit juice ones too. Usual practice is to freeze them and put them in a lunchbox to keep the other food cold – by lunchtime, they’ve thawed out, usually. I prefer mine half-thawed. Delicious icy slush, sooooo good on a hot day. I remember the little waxed-paper milk cartons… Nice >POP!< noise, indeed. And if there was a little milk left, you got good spatter, too! Ah, so that explains the puddle from yesterday! It’s milk! But that means… OH TEH NOES! Biff has a leak! I’m in university… and I still jump on all my juice boxes before throwing them away.. my excuse is, don’t waste! Must use box to its full potential! Sadly, my firmest memories of those were the guys in High School jumping on them without bothering to unseal them and drink the milk first. I had to keep my wits about me in the cafeteria area, because it was unsupervised and open air (yay for SoCal! ), and it was pretty common for guys to jump on milk cartons and ketchup packets just to spray the stuff around. Oddly enough, they never did that with juice or mayonase. I wonder why. In that strip, Biff reminds me Kryten from Red Dwarf.. 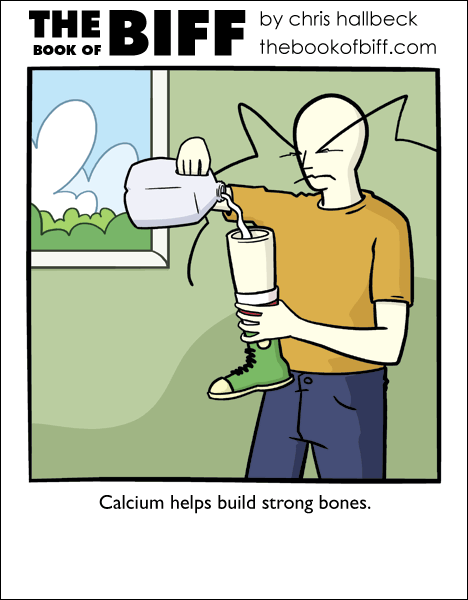 The milk must also help reattach his leg as well. I always wondered what your comic-making process is. Do you start with the caption or the image, or do you come up with both at the same time? @Zaffa – It varies. I usually come up with a story of sorts and go back and forth refining what the image should be and what the text should be. I try to split up the information between the two elements. It’s tricky to get the right balance. A few times, some kids would wedge a full milk carton into the lunch table so when they folded the tables up to sweep the floor after lunch, it would squish the carton and piss off the janitor so much. Is this why Biff’s skin is so pale? In elementary school our milk came in plastic bags, with a choice of strawberry, regular or chocolate. Practical kid that I was, I always had chocolate. For every school day for six years, I had a bag of chocolate milk. Now the sight of chocolate milk is repulsive to me. I do not drink it anymore. At one point I actually had BAGS of milk. That’s right, little BAGS of milk. Screw cartons. My middle school gave us little BAGS of milk to drink from. Yes, yes it was. There was one person in my high school group of friends who still thought this was funny…in HIGH SCHOOL. So some of my other friends decided to help him along and leave a perfectly-folded milk carton in the parking lot, right where he’d certainly see it, on a nice warm hyperactiveness-inducing day. They just skipped the “drink the milk” step of carton-popper preparation. Actually does it say “Milk helps Biff build better bones?” He’s just helping out! I have had both bags and cartons in the schools I’ve been to. I preferred the cartons. I used to fold them up into little “vehicles” to play with. So I guess nobody has ever done this, but when I was in high school, we used to pop the big gatorade bottle wrappers. You had to peel them off really carefully taking care not to rip them at all and then stick them back together in a perfect cylinder off of the bottle. You’d then stand it on end and, while slightly cupping your hand, slam it down on the wrapper. If you nailed it just right, the wrapper would let off a giant pop and the teacher would give you detention.